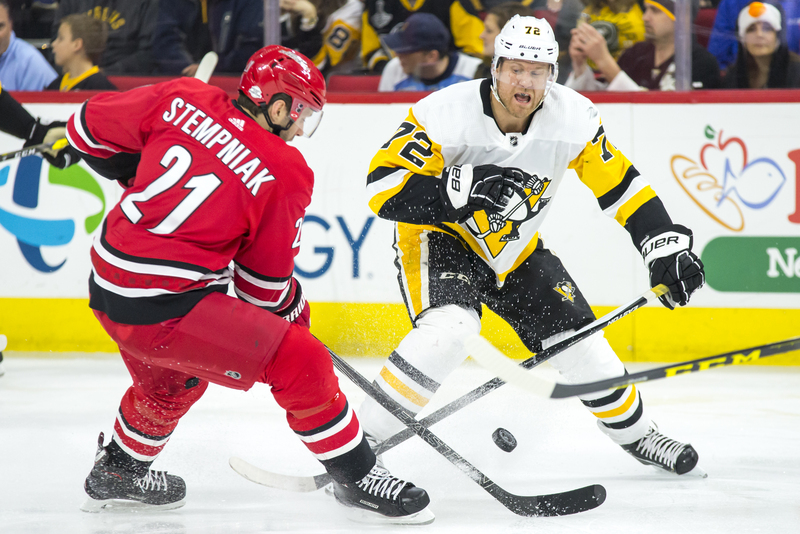 PATRIC HORNQVIST and LEE STEMPNIAK battle for the puck during a game between the Pittsburgh Penguins and the Carolina Hurricanes at PNC Arena (Credit: Spencer Lee). 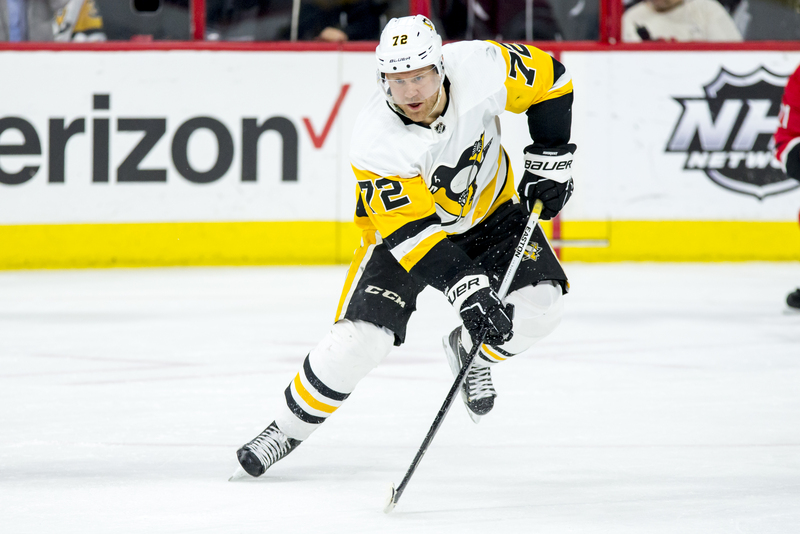 PATRIC HORNQVIST skates up ice after completing a pass during a game between the Pittsburgh Penguins and the Carolina Hurricanes at PNC Arena (Credit: Spencer Lee). 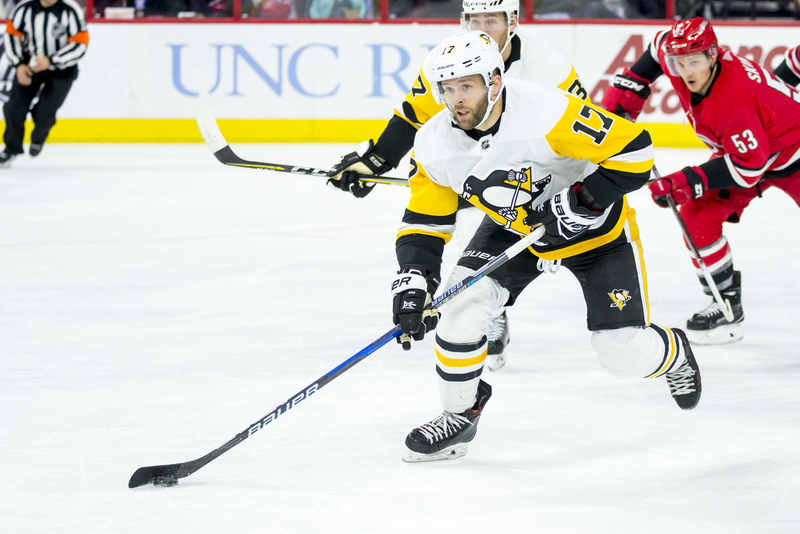 BRYAN RUST skates the puck out of the zone during a game between the Pittsburgh Penguins and the Carolina Hurricanes at PNC Arena (Credit: Spencer Lee). 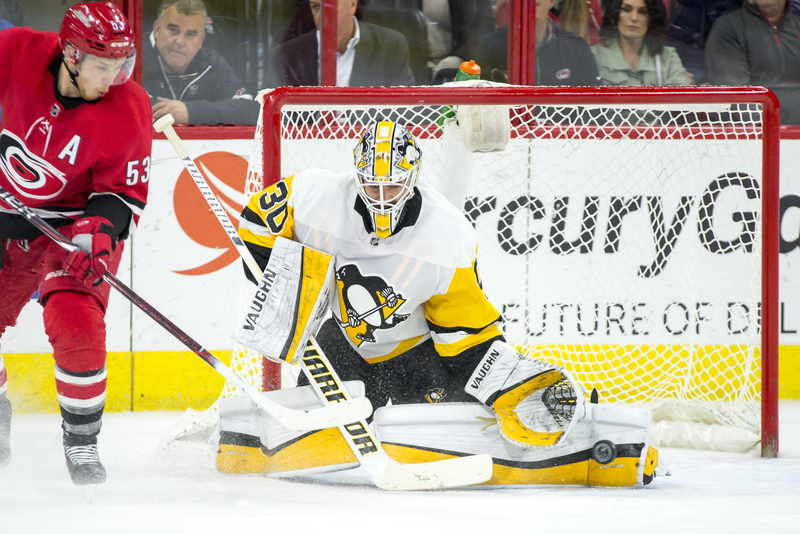 MATT MURRAY makes a save during a game between the Pittsburgh Penguins and the Carolina Hurricanes at PNC Arena (Credit: Spencer Lee). 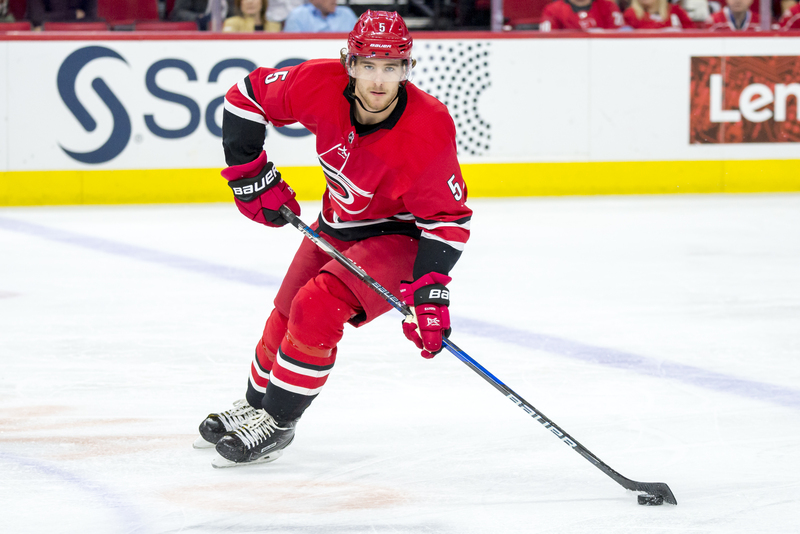 NOAH HANIFIN skates the puck up the ice during a game between the Pittsburgh Penguins and the Carolina Hurricanes at PNC Arena (Credit: Spencer Lee). 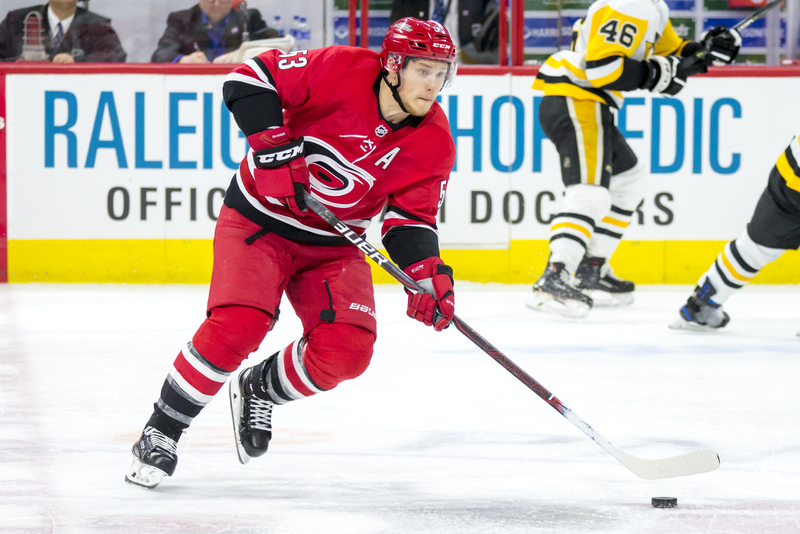 NOAH HANIFIN fires a shot on goal during a game between the Pittsburgh Penguins and the Carolina Hurricanes at PNC Arena (Credit: Spencer Lee). 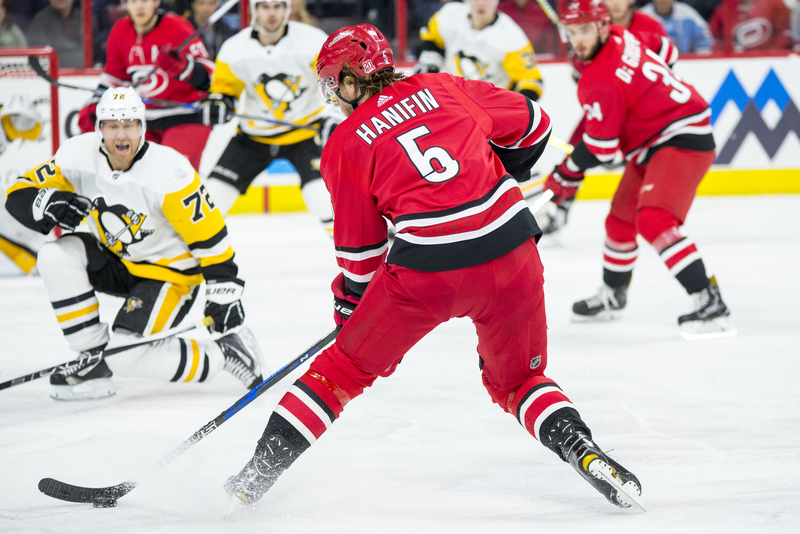 RALEIGH N.C.- The Carolina Hurricanes matched up against the reigning Stanley Cup champions Pittsburgh Penguins on Friday night in front of 18,180 fans in the PNC Arena. The last time these two teams played in Raleigh on December 29th, the Canes pulled out a 2-1 victory. However, this would not be the case on Friday with the Penguins dominating the Hurricanes lost defense. Constant action between both teams kept the first period fresh and exciting throughout. The Penguins fast paced offense challenged the Canes early with the Penguins shooting 11 attempts on Cane’s goalie Cam Ward. Jake Guentzel started the scoring with a goal coming with 6:24 remaining in the period. Phil Kessel would assist to start his night. The end of the first would end 1-0 Pittsburgh. The Penguins continued to press in the second period with 3 goals. The first only coming 46 seconds into the period, by Olli Maatta’s wrist shot from Evgeni Malkin’s successful face off assist. A minute later, Hurricane’s forward Teuvo Teravainen would put them on the board with his 15th goal of the season with the assist by Elias Lindholm and Sebastian Aho. Giving Aho 26 assists on the year. After the Canes’ score it was 2-1, however that would change quickly as the Pens forward Phil Kessel added 2 goals in 3 minutes to add to the Pittsburg lead. Jake Guentzel assisted on both goals, with Brian Dumoulin and Riley Sheahan both acquiring one assist each respectively. After Dressel’s scores, the Penguins were holding a comfortable 4-1 lead while the Cane’s struggles continued. The Penguins kept the onslaught coming through the third period. With Sebastian Aho in the penalty box for high sticking, All-Star Sidney Crosby would capitalize on the power play with a wrist shot finding the net for the fifth Penguins’ goal, assisted by Kris Letang and Evgeni Malkin. This would be Crosby’s 20th goal of the season. Malkin would go on to score the final goal of the game off an assist by Zach Aston-Reese closing out a powerful performance in front of the Hurricanes home faithful. Frustration was an understatement for Cam Ward with a mediocre .846 save percentage and it would boil over after Malkin’s goal. He would slam his stick on the goal post breaking it into two and throwing it across the ice. His actions would receive a 10 minute penalty for misconduct and convey the disappointment he had for his play Friday night. The game would end 6-1 with a Penguins victory, propelling them to a 36-22-4 record and strengthening their hold on the first seed in the Eastern Conference. As for the Canes, they fall to 27-24-10 with a 4 game losing streak, while trying to find a way into the Eastern Conference final wild card spot.